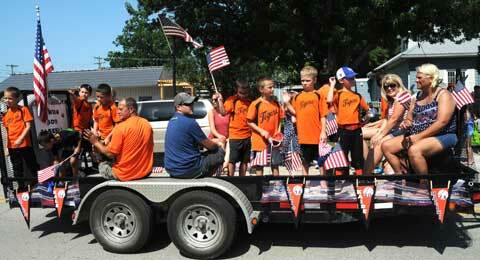 Lyndon’s boys baseball teams celebrated America’s favorite pastime with floats and flags. Osage County parades will wrap up for the summer with the Overbrook Osage County Fair parade on the evening of Aug. 11, but one of the area’s most patriotic parades happens on Fourth of July at Lyndon. For the Fourth, the city of Lyndon, Lyndon Pride, Lyndon Saddle Club, Osage County Fire District No. 5, Lyndon Lions Club, Masons and others joined together to put on a daylong community celebration. In addition to the parade, the day includes a pancake feed, picnic lunch in the park, kids’ games, free watermelon, with a finale fireworks show. While fireworks season is past, here’s a flashback to this year’s celebration – parade photos and results. All American Award – “All American Pass Time” float presented by the Lyndon 7-9-year-old boys baseball team. Land of Liberty Award – Malachi, Ava and Katie Shepard. See more Lyndon Fourth of July Parade photos here. 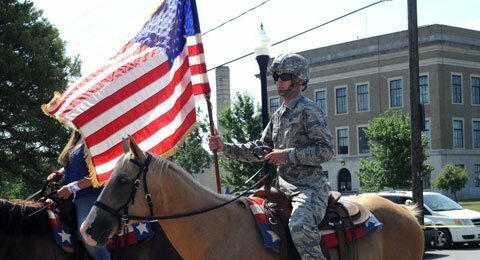 A mounted soldier displays the colors as a parade finale. 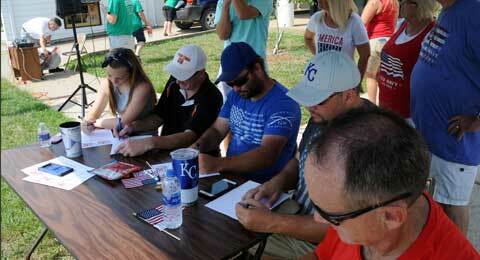 Judges have the difficult task of determining the best floats and parade entries.